Art Rickerby—Time & Life Pictures/Getty Images. 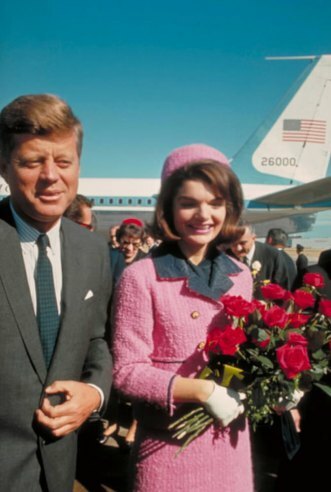 The couple at Love Field, Dallas, Nov. 22, 1963. The Kennedy assassination gets a mention in my book. November 22, 1963, had gone down in my family lore as the day that my mom and dad had their first date. It was a Friday, and even though a nation grieved, life went on, especially for 19-year-olds in the Midwest. “Picture this: November 22, 1963. The young, charismatic president has just been shot. Their president. Smooth, charming, good-looking. Catholic, like them. A pall descends over the country, an eclipse changes daylight into darkness, hope into anxiety. A collective grief hangs like a veil over the eyes. But the grief is suspended for just a moment, as a young man and woman have a first date. “They do not succumb to the shadows the images cast. The queen on a plane weeps, still wearing her pink suit smeared with blood. Children dazed; they will barely recall their father’s embrace. The couple was promised Camelot, and now it’s over. What’s next? There’s a war in a place called Vietnam that’s just beginning. Rumors of a draft swirl. The young man is at the perfect age to be taken, snatched away from his parents, from Waseca, from this petite young lady friend. It just seemed important to me to include this detail in my book. In order to better understand my life, I had to try to understand my parents, who they were, where they came from. What would it be like to start a new course in your life at the exact same time as a national tragedy? I can’t help but to think that the dark psychic energy of that day would sink in and leave its imprint. This short piece in Chapter 3 is my attempt to get at the heart of that. To quote a popular Latin antiphon: “Media Vita In Morte Sumus.” In the midst of life we are in death.